Is Australia's Best Burger On The Sunshine Coast? Is Australia’s Best Burger On The Sunshine Coast? There's a new heavy-hitter in the Aussie burger scene. Yeah, yeah it’s a big call, but we’re saying it. Australia’s best burger joint? Betty’s Burgers on the Sunshine Coast. Sure, it’s a controversial choice – just a couple of months ago Yelp named Melbourne burger institution 8bit their best burger in Australia – but sometimes it just comes down to a bloody good burger in a bloody great setting. In a world where white truffles, free-range bacon, gluten-free buns and even a glazed donut are finding their way into our burgers, sometimes it’s the simple things in life that catch our eye. 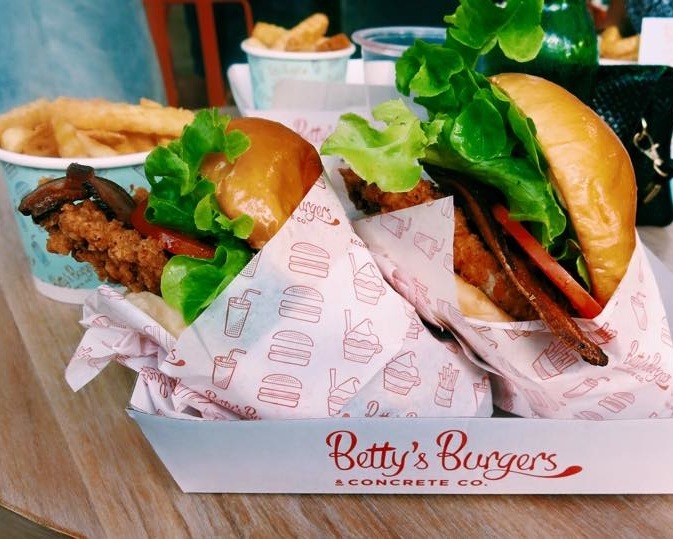 With two stores in sunny Queensland – in Noosa and Surfer’s Paradise – Betty’s is proving itself to be a heavy hitter on the Aussie burger scene. Their menu is simple – only six burgers (and a kiddie’s version) are on offer. The coup de gras is the Betty’s Classic – Angus beef, lettuce, tomato, onion, cheese and Betty’s special sauce. Pair it with a side of french fries or crispy beer-battered onion rings and finish it off with one of their signature concretes – a rich frozen custard dessert topped with decadent extras and candies. Sometimes it isn’t about loading your burger with extras upon extras – a good burger can come down to a few simple things and Betty’s has this down to a tee. A sturdy bun, some beautiful looking lettuce, melted cheese, crispy onion and tomato, and a healthy slab of meat. It’s good old-fashioned burgers done right. Saying that, they obviously don’t shy away from the extreme here either. You can get your franken-burger and eat it too. Say to hell with your new year’s diet and order this monstrosity: Betty’s fried chicken burger with bacon and double beef. Don’t judge until you’ve tried it for yourself. Go on, you’ve got to. There’s no shame in planning a holiday around a burger. Check out Qantas flights to the Sunshine Coast today.